Latin, despite what people might tell you, is a very cool language. Consider Napoleon Bonaparte, a Corsican who came to power in France and from there conquered Europe, had the Latin phrase Ultima Ratio Regum (The final argument of kings) inscribed on one of his cannons. Somehow saying the same thing in French – Le derniner raison du rois seems less impressive. In developing a “re-imagined” version of the PC classic X-Com: Enemy Unknown Firaxis Games and publisher 2K Games have rebranded the titular extraterrestrial research and defence organization with a cool new logo and words befitting the Seven Kingdoms of Westeros. Vigilo Confido. What does it mean? Well that depends who you ask. X-Com lead designer Jake Soloman probably has one definition in mind. The trick with Latin is that there are usually ten meanings for a single word. Naturally, you might ask how anybody in the Roman empire ever understood what they were saying within such an ill defined system, especially when Rome’s biggest cultural influence, Hellenic Greece, had a language where there were never less than ten words to express a single concept. Much of a sentence’s meaning in Latin is tied to a grammatical system which is in some ways far more specific than what we have in English or French. Also, a lot of understanding Latin has to do with context. So let’s break things down. The first word, Vigilo is probably the easiest to parse, though not at one in the morning when I first started trying to figure this out. For some reason I assumed both of the words to be nouns acting as an indirect objects. You can see the proof on the Page of Reviews’ facebook page. Latin is all about the verbs. “Start with the verb,” my Latin professor would always say when we were stuck on translations. Vigilo looks to be a first person singular, present tense, active voice conjugation of the root verb Vigilare (To monitor, to guard, to keep an eye on). 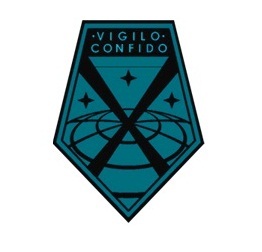 Given the nature of X-Com’s work, monitoring and responding in force to alien incursions on the Earth, which is represented by wire frame lines of latitude and longitude in the south half of the patch, Vigilo is probably best translated as “I am watchful.” A literal or “Barking Dog” translation would probably be closer to “I am watching” but mottos are meant to be somewhat more artistic in their meaning. Figuring out Confido proves a bit more of a challenge. The simplest translation for the infinitive Confidere is “to trust”. But X-Com’s mandate is anything but trusting; they are suspicious and questioning by design. Though, I suppose confido could be read as I am trustworthy, but that seems too much like something a person puts on a cover letter, not a motto. Other definitions include: to have confidence in, to take refuge in, to rely upon. Now we are talking. The safe translation would be “I am relied upon.” As mottos go, “I am watchful. I am relied upon,” is pretty solid. I, however, want to take it a step farther. To rely upon something is to deem it necessary. Granted it is a bit of a stretch, but why not translate Confido as “I am necessary.” It certainly fits with the theme of the game: a council of nations activating an international paramilitary organization as Humanity’s last line of defence. However, as a bottom line I’d have to say that the best translation for the phrase Vigilo Confido is I am watchful. I am relied upon. I really like “I am necessary,” but it’s too much of a conceptual leap. If by chance somebody knows of a precedent to justify “I am necessary” as the ideal solution, I’m all ears. 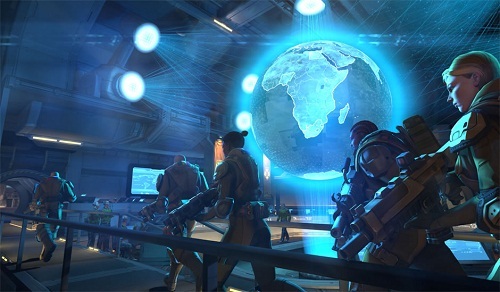 X-Com: Enemy Unknown releases October 9, 2012 on PC, X-Box 360 and PS3. Thanks for the in-depth explanation, with no real knowledge of latin construct at all I had presumed it was a pseudo translation of sorts, like: ‘Vigilance. Confidence’ (not too far from the mark it seems but I suspected confidence as in discreet rather than the certainty of doing well – which kind of matched your idea of the covert/clandestine activities that Xcom have to get involved in). The level of detail that seems to be going into this game is amazing, definitely one of my most anticipated titles in years after being such a fan of the original. Vigilance is really not all that far off the mark. Translating it as “I am vigilant” would be just as correct as “I am watchful” in this case as it would have meant the same thing to Roman ears. Same goes for Confidence/I am confident. Partly a matter of personal choice from the translator, partly an issue of English being more like Greek in its huge sprawling vocabulary than Latin ever was. And yes, the detail that we’re seeing is nothing short of amazing. I don’t want to get my hopes too high, but Firaxis is not a company known for dropping the ball when it comes to projects like this. Significa: Permaneça atento,sem que os outros percebam. Awareness in secret. I think we need to remember that the makers of the game may not be Latin professors. In fact, the answer to what “Vigilo Confido” means to them is already in the game. The council representative will often say “Remember: we will be watching.” This phrase can either be interpreted as an assurance to the people of Earth that XCOM is watching over them, or as a threat to the aliens that XCOM is watching them, or even perhaps both. So from “Vigilo Condifo” to “you can be confident that we are watching” to “We Will Be Watching.” Sounds like a simple and respectable motto to me for a clandestine defense force. Maybe the devs with this motto wanted to say something more like “In Vigilance I Trust”. If Vigilo is a second declension adjective in the ablative singular, then that might actually work. Though I would need to find my BIG latin dictionary to figure that one out. Cool ideal though, thanks. Makes a lot of sense. I’d been mentally translating it as ‘I see, I believe’ – the idea being that X-Com ignores how bizarre and horrifying things are, and just accepts what’s going on and deals with it. I am Italian and of course my language is a derivative of Latin. Latin is very complex and the meaning is derived from the context. I think the closest translation might be … “”Confident in it’s future I’m watching mankind””. I think is a clear reference to the hope that humanity can confront and overcome even the most terrible adversity. I just took two years of Latin. Confido is 3rd conjugation intransitive, so it makes the most sense for it to take the dative masculine sIngular noun vigilo as its object. “I trust in the watchman.” Is one variation, but that’s the jist. It doesn’t make much sense to just throw two verbs at you. BTW, the Latin grammatical system was so well designed, geeks are still using it to sound cooler thousands of years in the future. Nobody here is doubting the inherent awesomeness of Latin grammar, just that it can sometimes be a little murky. Although I don’t see the problem of having two conjugated verbs next to each other in a motto. Caesar’s most famous slogan was a series of three verbs. Disclaimer: I know nothing of latin grammar beyond some incidental phrases gleamed from law school. Going off your thread of “I am watchful”, and the translation of “confido “as relating to trust, perhaps a workable English translation would be “I am the trusted watcher”. This messes with the fact that “Vigilo” isn’t a noun, but it certainly flows a lot better as a motto since I rarely see two sentence mottos. It also fits into the fact that XCom is a clandestine project that watches over humanity with very little oversight (other than the Council throwing cash at you once a month). Sorry Giampi, I didn’t see your post, but now I see that your interpretation is near mine. I think SmartAlec is on to something with “I see, I believe” This has nothing to do with the Latin, because I know nothing about that language. My though process uses other evidence. If you take that in to context with the first word on the patch :vigilo” it might reveal Xcoms intended meaning of the words. Going with the “necessary” definition, “Necessary Vigilance” comes to mind. I’ve been studying Latin at the university level for 4 years, and I don’t see how confido can mean “I am relied upon”. It’s true that confido can mean “to rely upon”, but you can’t use that to argue it can mean “to be relied upon”. It would have to be in the passive tense, and it is definitely in the active tense. You could translate it as “I rely upon” but then the question is what does it refer to? I would translate it as “I believe” or “I am confident”. It definitely doesn’t mean “I am necessary”; if that’s what whoever came up with this wanted it to say, they would have used something like requiror (“I am required”). Personally for the whole thing I like “I watch, I believe”, but “I am vigilant, I am confident” would work too. You know, you are absolutely right. It would have to be passive for it to work. Thanks for the catch. I have zero background in latin, but I liked my assumed meaning that confido was similar in meaning to “confidential” than “confident”. Personally, I think “Secret Watch” is the best fit. Ever vigilant, ever steadfast is what I meant to say. Oh well. I think that “vigilo confido” might be more of a military-type motto. Like you said that Latin words have many different meanings, I think 1 translation could possibly be “Be vigilant, be confident!” It could be seen as a way to pump up our soldiers on the battlefield, especially since they are fighting an enemy never faced before. Coming from a Latin scholar (having just finished my doctorate in Latin poetry I think I can safely call myself that), the only possible way to translate `Vigilo; Confido’ is `I am watchful/vigilant; I believe’. Both can only be verbs (vigil, pl. vigiles = `watchmen’), in the first-person singular present active. `confido’ might mean `I am confident’; but usually that meaning (`to be confident (in oneself, someone else, etc. )’) is restricted to when the verb is used with an object in the dative: mihi confido `I trust myself’ (e.g., to know what I’m talking about here…). It also, as one person has rightly pointed out, cannot mean `I am relied upon’, which would require a passive form (`confidor’ or similar, thought that form never occurs in extant Latin). My suspicion, in the context of a game like X-Com, is that `Confido’ is a nod to another famous alien-filled X-: The X-Files, and Mulder’s poster with the flying saucer, tacked on the wall of his hole of an office: `I believe’. As a guy who’s parent teached Latin to him as a child I would say take all the meanings of each word, don’t figure out what it means for everyone, but say what does it mean to me? Latin is language of passion when speaking the words choosen also reflect emotion as well as the tone used my alter meaning in one conversation. It’s like FA GET ABOUT IT(i think might one word lol) tone an context change the meaning of it. Considering the mechanics of the game, maybe it’s a bit less serious. Trust in Overwatch. Trust in Overwatch, especially in Ironman. Excellent breakdown. Being a native speaker of a romanic language, I somewhat assumed this was the meaning, but naturally I could not be sure. Thanks! I personally like “Be confident, for we are vigilant”. 6 year latin student. I immediately read it as, (I am) Vigilant. (I am) Trusted. As in Confidential Vigilance, this is what the XCOM Project does, doesn’t it? Stay in the shadows, engaging the alien threat with guerilla warfare and stay under the radar from the public. “Le dernier argument des rois” is more correct. All of your translations are great and work… keep going!!! vigilare (to be alert); therefore vigilo = I am alert. confido (i trust in) but requires an object (it is a transitive verb) in the dative. but to me it made more sense to say “I am trusted” only because it matches the tone of the first part even though it’s not the literal translation. In my understanding I had perceived it to be “Vigilance In Secrecy”. But when it comes down to it, we can debate it all we want and we still never may be correct. You’re stretching the Latin too much. Confido is an _active_ verb. You’re turning this active meaning “I rely upon” into a passive construction “I am relied upon” which would be a different form of the verb (i.e. confidor). “In Vigilance I trust” sounds as correct as useful for me. I always thought that it was odd how the hidden guy always ended his overview with, “as always, we are watching”. After just finishing the game, “I am Vigilant” makes the most sense – especially with all that advanced technology reverse engineered ( combined with being face-rolled by the unknown ).